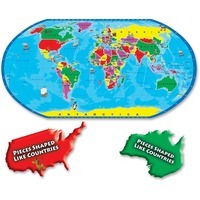 The World Puzzle features pieces that are actually shaped like the countries of the world so you cannot complete this jumbo piece puzzle without figuring out where every country is located. Build the puzzle and learn the world. It includes all the countries of the world. Numerous illustrations designate famous landmarks and indigenous animals to entertain while increasing the educational experience. The 80 pieces are large and sturdy to enable children to easily handle the pieces and the pieces to easily withstand the children. Pieces are all larger than tight government standards for choking hazards and are safe to have around babies. In some cases, multiple countries have been combined into one piece to ensure no potential choking hazards. Puzzle is designed for children ages 5 and up.